Well, As one goes through life there is always something else to learn and that is certainly what is happening for me at the moment. When the World Wide Web first came into being I thought it wasn’t something I would ever need to know about. How wrong can you be! I have gone from learning how to use e mails, build up on my own web sites and now I am learning how to create videos to be included in my online courses. It’s no good, if you are self employed, no matter what your operation, technology can not be ignored. The benefits of creating on line courses became apparent last year and I have been busy trying out all sorts of ideas, subjects and teaching platforms. I have now changed platforms and am going to be uploading my courses and workshops to Udemy. I guess this is a play on the two words ‘You and Academy’ = Udemy. Anyway, it is another order kamagra online australia American teaching site, but they seem to have a much higher profile than the one I used before, and a more professional structure, but it is making me jump through all sorts of ‘learning’ hoops. Now I am in the world of making videos that will show the viewer how a technique is done. This has proved rather tricky when I am trying to keep one eye on the viewfinder, do the painting and narrate as I go along. I have done a few but am discovering that my equipment is wanting. I certainly need to light the area better and I think my camera may not quite be up to the mark as when the video goes to full screen it looks rather grainy. So where now? More research I suppose, maybe a camera upgrade and I may have to create a designated recording area. I don’t thinks Steven Spielberg need be concerned. Oh well, back to the drawing board. 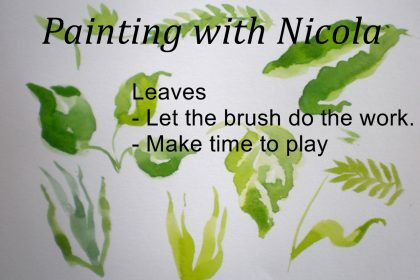 Relax & learn watercolour painting as you play. Just copy me. Watercolour painting leaves. Relax and play and let your brush do the work.